These bins are available in 21 sizes. The bins are manufactured from heavy duty, virgin, high density, FDA approved polypropylene/polyethylene. The bins feature large, multiple label slots for easy insertion of labels, which results in more convenient content identification. 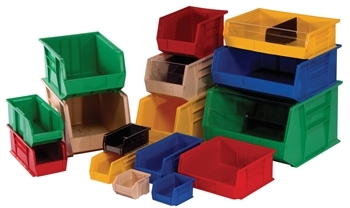 An extra wide storage ledge ensures stability so that many bins can be stacked on top of each other. The bins� reinforced design adds strength and prevents spreading. Due to the material which the bins are made of they will not rust or corrode, are unaffected by weak acids and alkalis, and are waterproof. These bins are interchangeable with other manufactured brands of bins.